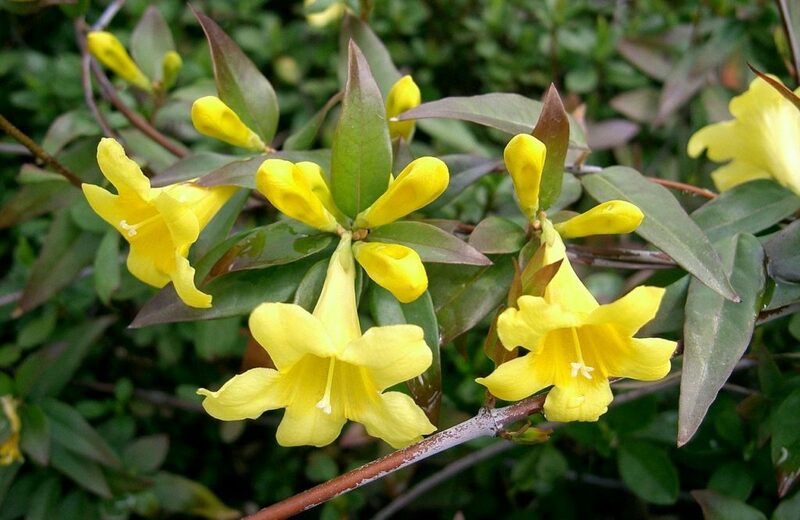 Common Names: Yellow Jessamine; Yellow Jasmine; Carolina Jasmine; Gelsemium. Gelsemium sempervirens is a twining vine with yellow, trumpet-shaped flowers. Homeopathic remedies prepared from this plant are used for symptoms of mental, emotional or physical weakness. People needing this remedy lack confidence, feel timid or cowardly, avoid challenges, and are prone to anticipation anxiety or fear. Avoidance leads to withdrawal and dullness. Physical symptoms include weakness, heaviness, trembling, diarrhoea, and frequent urination. Numbness or paralysis of body parts may occur. Symptoms follow fright, excitement, bad news, or anticipation. Anticipation anxiety from any sort of ordeal such as exams, performances, and presentations. Trembling and diarrhoea from anticipation or fright. Heaviness and weakness with the trembling. Paralysis from anxiety or fear. Aching and heaviness of head, eyes, and muscles. Weakness, heaviness, and trembling with any sort of exertion. Chills alternate with flushes of heat (no sweat with fever). Useful remedy for when the patient complains of “never having been well since the flu”. Heaviness, weakness, blurred vision and exhaustion. Dull pain that starts on the back of the head and spreads to the forehead. As though a tight band is around the head. Heavy head – can hardly lift it. Heavy eyelids – eyes half open. Dizziness and visual disturbances – as if drunk. Headache relieved by copious urination. Flu-like symptoms with weakness and lack of energy. Anxiety with any ordeal or event – shaking and trembling. Where do I find it? Gelsemium (Gels.) is available from our online store as a single remedy and is also included in the following Complexes (combination remedies): Fatigue – Physical; Insomnia from Anxiety or Grief; Jet-lag; Winter Defence. While above self-limiting or acute complaints are suitable for home treatment, see your healthcare provider if symptoms worsen or fail to improve. Chronic or persistent complaints, which may or may not be mentioned above, require a different treatment and dosage protocol so are best managed by a qualified homeopath for good results. For acute and self-limiting complaints, take one pill or five drops of the remedy every 1 to 4 hours (1 hour for intense symptoms, 4 hours for milder ones). Once an improvement is noticed, stop dosing and repeat the remedy only if symptoms return. If there is no improvement at all by three doses, choose a different remedy or seek professional guidance. Chronic symptoms or complaints require a course of professional treatment to manage the changes in potencies and remedies that will be required.